We start out, of course, with bananas. 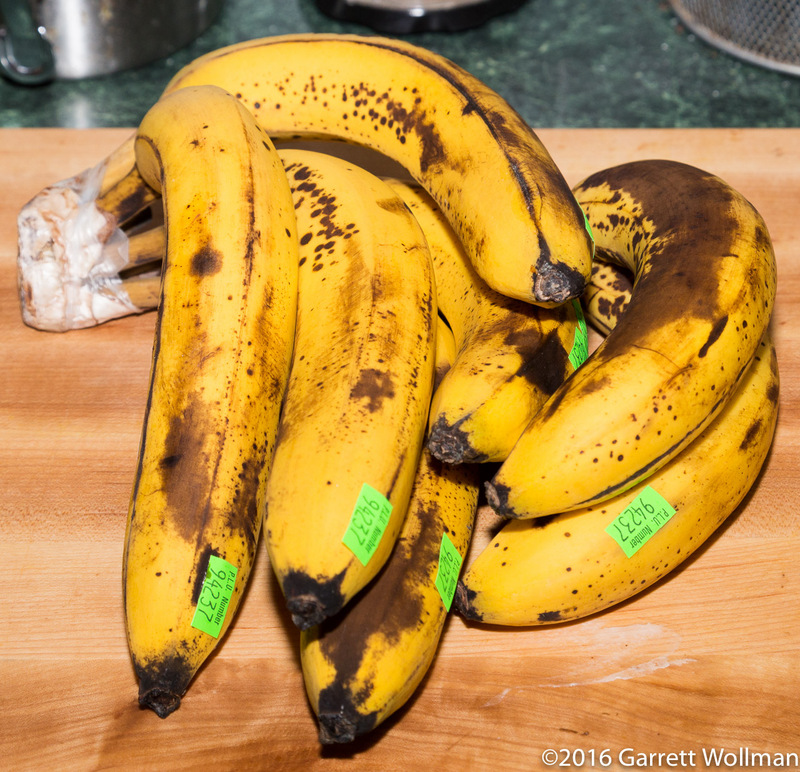 I find it fairly difficult to buy truly ripe bananas in the supermarket, so I generally buy green ones a week early and let them ripen on the kitchen counter until I’m ready for them. If any show signs of going off prematurely, I stick them in the freezer — frozen bananas are no longer useful for eating but just as good as fresh for any application requiring mashed banana. Both recipes require 75 g of walnuts, but differ in procedure. The original recipe calls for walnuts which are toasted and then chopped; the Less Sugar recipe calls for chopped walnuts which are subsequently toasted. That’s easy enough to manage with two quarter-sheet pans, in a 325°F (160°C) oven for about nine minutes, shaking the pans about halfway through. Both recipes make a single 9″×5″ (23 cm × 13 cm) loaf, which (after baking) makes nine generous or twelve moderate portions. I broke with my usual practice and used the traditional butter-and-flour lubrication technique for these rather than baking spray, just because. 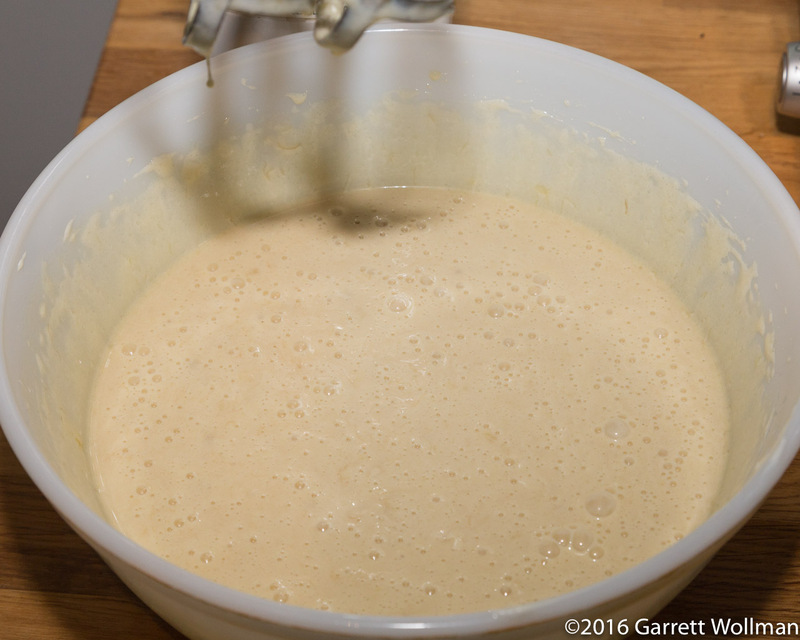 The process starts by what I’ve come to think of as the “mayonnaise method” — a variant of the “muffin method” used for many quickbreads in which the eggs and sugar are first beaten to ribbon stage, about eight minutes using a handheld mixer. 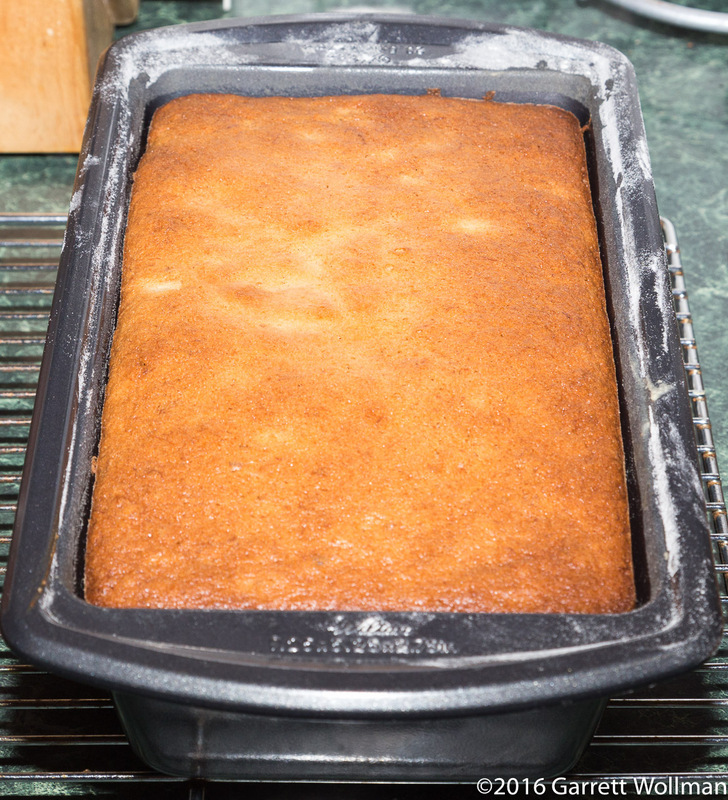 This photo shows the original recipe proportions after about five minutes of beating. Once the eggs have made a sufficiently sturdy foam to handle it, the construction proceeds by slowly drizzling in the vegetable oil (hence the “mayonnaise method”) so that it emulsifies with the eggs. 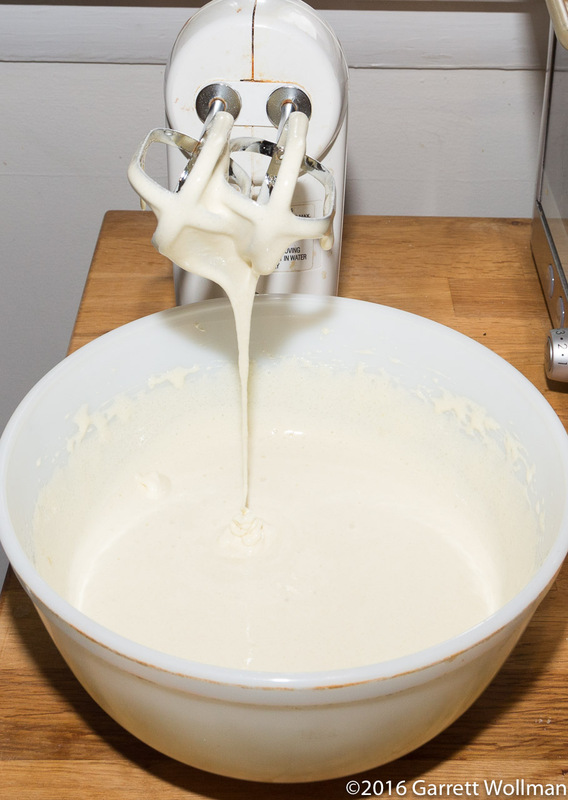 Then the remaining wet ingredients — bananas, vanilla, and crème fraîche — are mixed together and then stirred into the egg-sugar-oil mixture, working quickly so as not to deflate the egg foam, and finally the remaining dry ingredients are combined and folded in by hand. The Less Sugar version departs from this slightly by par-cooking two of bananas in the microwave after mashing them; the result is combined with the third mashed banana, raw, and the crème fraîche and vanilla as before — mixing the par-cooked banana with the other ingredients cools it down sufficiently to add to the egg foam without fear of curdling. Once again, the original recipe is shown on the left and the Less Sugar version on the right — note how much higher the revised batter comes up in the pan. This won’t turn out to be a problem because the Less Sugar version also has less leavening, depending more on the egg foam for its volume and texture. The original recipe calls for 60–75 minutes of baking time, which leads to a more caramelized appearance than the Less Sugar version at only 50–60 minutes. Both are baked at 325°F (160°C), although I did not attempt to bake them simultaneously. 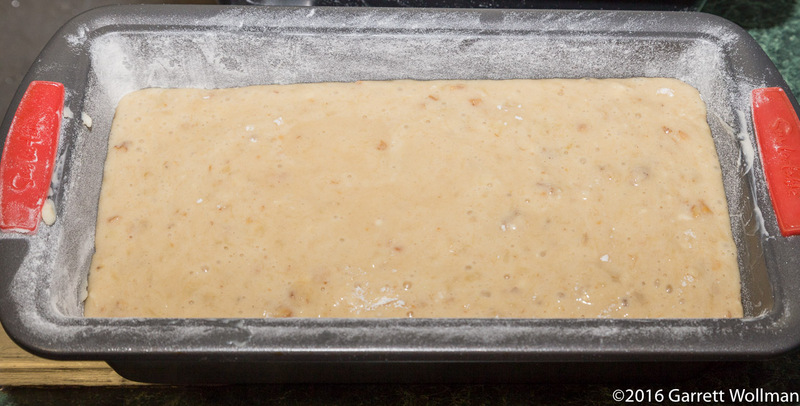 When done (the finished bread should spring back when pressed in the center), the bread must cool in the pan for about 30 minutes. The recipe here says “at least 30 minutes”, but I wouldn’t advise leaving it much longer than that, because the steam released by the cooling bread can condense and make the bottom of your loaf soft or even soggy if left in the pan. Finally, here the two loaves are, side by side. Once cool, I wrapped them tightly in plastic wrap for the trip to the office on Tuesday. As I mentioned in the intro, tasters were split on which one they preferred. Those who liked the original version better noted its texture, the slightly caramelized flavor, and moistness; those who preferred the revamped recipe commented on its lightness and banana flavor. This entry was posted in Food and tagged banana bread, bananas, Joanne Chang, recipe. Bookmark the permalink.